NM Bryon Doyle and Class B players Timothy Werby and Sos Hakobyan each scored 3-1 to share 1st-3rd place at the BCS G/45 June 30 at The Berkeley Chess School. Doyle directed eight players in the open G/45, and six in the blitz tournament following, where he won again with 5-1, tied with NM Michael Walder. White to play has 8 Qe8+! Rg8 (8..Rxe8 9. Rxe8+ Rg8 10 Rxg8#) 9 Qxg8+ Rxg8 10 Rxg8#. A different kind of missed opportunity arose in my game as White with Daniel Oshima. 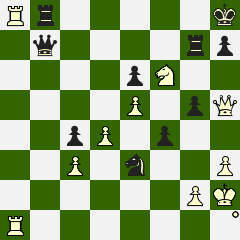 The obscure Gibbins-Weidenhagen Gambit (1. d4 Nf6 2. g4) is my favorite. Black’s answer 2…e5 is the Oshima Countergambit, hatched during an analysis session Oshima shared with FM Clyde Nakamura (another Gibbins-Weidenhagen enthusiast). Nakamura gave Oshima credit for the invention. I told Oshima this story, and he laughed. 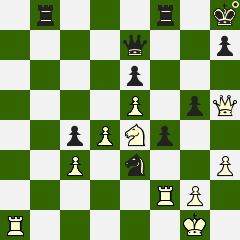 But when I had White against him at the G/45, and started 1. d4, he replied 1…e6. “Where’s the Oshima Countergambit?” I said. “You’d have to play the Gibbins”, he said. Didn’t he think I would after that conversation at the Senior Open?